In 1937 the ‘Supper at Emmaus’ was discovered in France. All the experts agreed that the painting was a masterpiece by the seventeenth-century artist Johannes Vermeer. By acting quickly Museum Boymans was able to snap it up from under the noses of other interested parties for a record sum. Eight years later, there were astounded reactions when Han van Meegeren announced that he had painted the work. 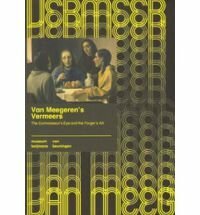 It then emerged that he had been responsible for a number of other ‘Vermeers’ and ‘Pieter de Hoochs’, which had meanwhile been bought by a number of Rotterdam collectors, the Rijksmuseum and Hermann Goering. This Boijmans Study reconstructs the notorious story of the forgeries and tries to discover how the entire art-historical world could have been so misled.